The fragrance of the rose is the fragrance of love and a true treasure. More than 30 hand-picked Damascus rose petals are needed by our organic farming partner from Turkey for a single drop of pure natural rose oil. 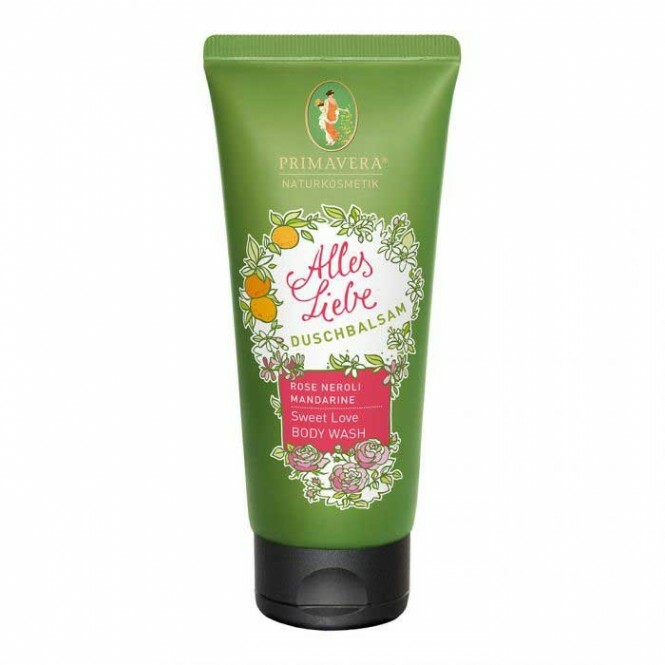 The fragrance composition "Alles Liebe" spoils with rose, neroli and tangerine and gives harmony and joie de vivre. The creamy shower balm gently cleanses with mild sugar surfactants. Valuable, cold-pressed bio care oils from olives and chia seeds preserve the natural moisture of the skin and have a moisturizing effect. BIO ROSE OIL, particularly skin-friendly, promotes cell renewal. The rose aroma provides inner harmony. ORGANIC MANDARIN OIL The scent has a mood-enhancing and refreshing effect. NEROLIÖLL revives, invigorates and harmonises the senses. BIO CARES OIL and chia seeds preserve the natural moisture of the skin and have a moisturizing effect. Application: Massage into damp skin. Enjoy the scent. Rinse.